"Documentary editing is perhaps one of the most challenging intellectual feats on the planet…How does anyone do it?" 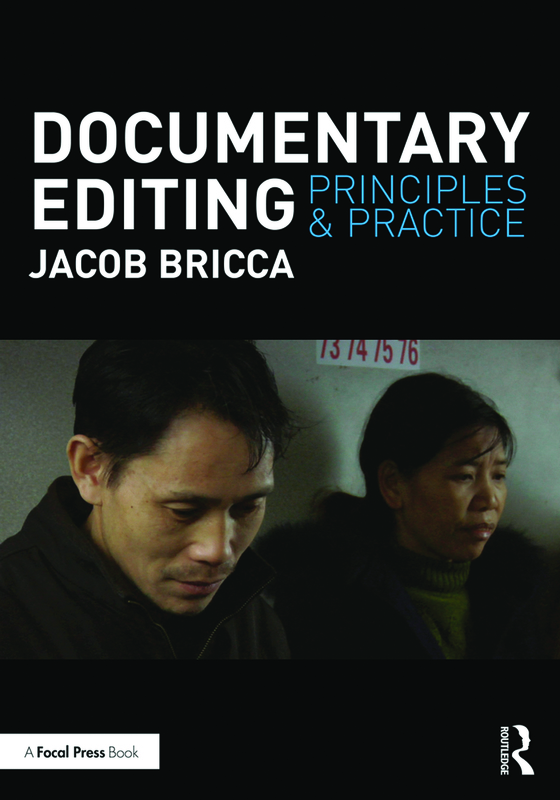 Author, educator and film editor Jacob Bricca asks the question in the introduction to this how-to book on editing the documentary and then spends the next 240 pages providing a very satisfying answer. He clearly reminds us of the difference and relative ease of editing a narrative fiction film, in which "by and large, we already know the intention of every scene and the approximate purpose of every shot." Compare that to the twists and turns that often occur in the filming process of documentary, where the filmmaker may think they are making one film at the start, and by the end of filming, the meaning or purpose of the available footage is still debatable. It is a well-accepted truism that in documentary film practice "the story is created in the editing room." Early on, Bricca sets us straight regarding the genre's problematic claim to "truth" in storytelling. Jean Rouch pointedly challenges the hubris inherent in documentary’s assertion of possessing truth in his discussion of Chronicle of a Summer, the groundbreaking 1961 film he made with Edgar Morin: "How do we dare speak of a truth that has been chosen, edited, provoked, oriented, deformed? Where is the truth?...We have only provided a few pieces of a puzzle that is missing most of its parts. Thus, each viewer reconstructs a whole as a function of their own projections and identifications. Our characters are perceived globally by means of mere fragments of themselves." Bricca lays out his 10 principles of documentary editing: (1) Contain the Chaos; (2) Trust in Process; (3) Look at the Problem from as Many Angles as Possible; (4) Anchor the Narrative; (5) Delay Gratification; (6) Define the Point of View; (7) Favor Firsthand Experience; (8) Embrace the Unexpected; (9) Always Be Prepared to Walk Away; and (10) Simplify, Simplify, Simplify. Bricca has made a worthwhile contribution to understanding the editing process before we’ve even gotten to the first chapter. The ensuing 18 chapters are divided into six parts, which follow the logical sequence of tasks an editor should accomplish when faced with the opportunity of actually editing a project. Starting with "Planning Your Schedule," Bricca cites the importance of setting realistic goals. In this and all the subsequent chapters, he draws on the expertise of seven award-winning editors, including Kate Amend, who has edited more than 35 documentary features; Marshall Curry, a two-time Academy Award-nominated director/editor; Mary Lampson, who worked with Barbara Kopple on Harlan County U.S.A. and with Emile de Antonio on Underground and Millhouse; Fiona Otway, editor of the Sundance Grand Jury Prize winner Hell and Back Again and the acclaimed James Longley film Iraq in Fragments; Geoffrey Richman, editor of the Academy Award-winning The Cove; Kim Roberts, a Los Angeles-based documentary editor whose credits include Food, Inc. and Daughter from Danang; and Aaron Wickenden, a longtime member of the Chicago collaborative Kartemquin Films. The experiences of these editors are woven throughout the book, sometimes used to confirm general conclusions and at other times used to warn against mitigating factors such as having to obtain approvals from a large number of producers and stakeholders involved in the project. Each chapter is rich with technical information, deftly supported with graphic examples from case studies that provide clarity and give the book a hands-on immediacy, making it useful for anyone contemplating editing as a career choice. I would also highly recommend this book for anyone who works with an editor—or anyone in the industry, for that matter. Although I worked over 20 years as a distributor and marketing/funding consultant to documentary filmmakers, most of whom deployed vérité style in their work, I was unaware of many of the challenges and obstacles editors faced. This book helped me to understand why certain scenes were successful and others were not. The section on "Microbeats: Sculpting Human Behavior Onscreen"—in Chapter 8, entitled "Vérité Editing" —was particularly informative. Chapter 10, "Choosing and Framing Footage," provides a guide in how to think about the material at hand. Bricca acknowledges that every film has an internal logic that successful editors manage to tap into, but ultimately, "We should always try to bring the audience as close as possible to first-hand experience." Organizing your footage on a chart listing "A Hierarchy of Experience" shows which footage has the most direct link to your main characters. That would be at the top of the list. Footage that informs the audience about events secondhand, like in talking-head interviews, would be further down on your list. Aaron Wickenden states the value in this method, based on his personal experience: "I've found that the closer you can get to the source and the closer you can get to the event itself, the more interesting the footage is." Each chapter is relatively short. Bricca is following his own advice to "Simplify, Simplify, Simplify." The information is condensed, concise and chockful of useful advice that I often found eye-opening. In Chapter 11, "The Fundamentals of Narrative," are broken down to include three "must-haves": characters, conflict and progression. Every documentary utilizes these same three elements in different ways, but they are always there. In all this clarity, there is also room for subtlety, as in the discussion of text and subtext and how "ultimately, it is the subtextual elements of a film that will make it memorable." Logically, the next-to-last chapter, "Fine Cut to Final Cut and Beyond," Marshall Curry explains how he must "go through and question every clip, every bite, every breath to make sure it truly needs to be there." Interestingly, I know more filmmaker/editors who are more afflicted with the issues in the sub-chapter, "Moving Backwards and Overcutting," rather than ignoring details. To those filmmakers Bricca admonishes, "Some of this skepticism is healthy, but some of it is dangerous." Mary Lampson adds to this warning that there is a danger in oversimplification when "you can easily lose valuable idiosyncrasies in the service of trying to streamline a film…I've seen films that have lost their heart in the 'cleaning-up' stage." The book wraps up in Part 5 with the analyses of four films: My Kid Could Paint That (2007), by Amir Bar-Lev; An Inconvenient Truth (2006), by Davis Guggenheim; and two short documentaries—Skip (2011), by Fielder Jewett; and Hotel (2014), by Elizabeth Lo. Three useful appendices provide a list of films cited, case studies of schedules for feature documentaries and documents an editor will need. There is much to recommend in this book for teaching in film production classes, but as a writer I found that certain elements could be applied to my own editing in words, rather than pictures. Ultimately, Bricca unravels the complexity of editing, demystifying the art of storytelling in the process.